The fear of the Doomsday – a worldwide catastrophe – was not justified. We have to be afraid not of the End of the World but of the beginning of global cataclysms. They will destroy us not together, but one by one. December 21, 2012 is the beginning of great changes in the world. It is the end of one cycle – the cycle of Consciousness and the beginning of another – the cycle of Correction. December 21, 2012 is the beginning of a new era – fulfillment of mankind’ dream of immortality! It is the beginning of global cataclysms of the planet’ destruction. The goal of all future destructions is the transformation of the old world into the new one, the transition of consciousness to the next higher level of perfection. This is not the end of everything, but the beginning of a new coil of consciousness development. The End of the World is a certain moment of time when humanity will make the Transition to a safe level of the material world in the next cycle of life through the consciousness’ unification. That is why the date of the End of the World events is unknown, because it is the decision of humanity, which can be accepted and fulfilled at any moment before the second preliminary cataclysm. Thus, the date of the Doomsday can not be known, however, are known the dates of the first and the second pre-cataclysms beginning. The result of the «Great Transition» is physical and spiritual transformation of all Earth’ inhabitants on the Highest level of the material world at the moment of the General resurrection. Through the Transition into the new cycle of life, humanity will become immortal. Just from this point of view is considered the Doomsday in the Holy Scriptures. Here is why. Literally, the combination of the words «The End of the World» means death. Since the End of the World has to come simultaneously for everybody – for all humanity, it means the death of the whole civilization of Earth!? But it is not logical even in terms of reasoning of usual person. Earth and humanity on it, as well as huge variety of organic nature was not created in order to be all simultaneously destroyed – people, and the world, and the planet. Mankind has passed incredibly long way of consciousness improvement, reached such heights... and now, just so sudden breakage? This is inadmissible! «The End of the World» means simultaneous Transition of the entire civilization into the new cycle of life through the body destruction by the laser beam, caused by the synchronous unification of humanity consciousness and General resurrection on the Highest level of the material world. This is the only way to continue life and we have to be immensely glad that we have such chance! The Transition to the next cycle of life, humanity will make not by voluntary will, but forcedly in order to escape from global cataclysms of incredible strength of the planet destruction. If humanity will not make the Transition in time, it will be destroyed by global cataclysms. In this case, the End of the World will come individually for each of us but at different times. However, this is not consistent with the information of the Holy Scriptures, which indicated that the End of the World will happen simultaneously for all mankind. Thus, December 21, 2012 the End of the World, that is the Transition of Earth civilization to another safe level of the material world for the continuation of life, unfortunately, will not happen, do not even worry!!! The end of the World can really happen as a result of numerous trainings on synchronization of consciousness of all people of the world – by countries and continents. For the Transition is required not only simply synchronously to unite consciousness of humanity, but also creating homogeneous resonance structure of consciousness of Earth civilization. But the more important – through consciousness to cause the laser beam of enormous power. It is not easy, especially for the first time, but also not hard – confirm extraterrestrial civilizations. Yes! In order the End of the World really will come humanity have to fight... and to fight very hard! This Great Event, which will allow all of us to continue life, will not happen by itself! As it is known, the Mayan calendar ends on December 21, 2012. What means the end of the Mayan calendar? Why is highlighted the day of the winter solstice, but not some other day. Date, which corresponds to the shortest day and the longest night of the year? The beginning of global cataclysms. The end of Mayan calendar warns that the cycle of Consciousness of humanity on Earth is over, and from this moment will start global cataclysms of the planet’ destruction. However, the end of the Mayan calendar warns not just about the beginning of natural phenomena catastrophic for humanity. It points on the occurrence of a special constantly acting process of the planet’ destroying. Having begun, this process will prolong on the planet millions and millions of years – until the complete destruction of Earth. The process of the total destruction begins, as usual, with the demolition of the structure. The same way will be held the destruction of the planet. At first, the surface of the planet has to be aligned. This work will fulfill cataclysms of incredible strength. They will change the surface of the planet by earthquakes and faults, immerse in the ocean waters some continents, rise from the ocean’ depths others huge areas of land. Humanity is not a helper in such hard work – cataclysms will make it themselves. This broad scope of work on the base of different natural phenomena humanity even can not imagine. It is obvious, that to be on the planet at this time is extremely dangerous; you can watch it only from different territory, for example, from another planet. Thus, the end of the Mayan calendar warns humanity – leave dangerous territory and allow cataclysms to do their work in the full extent of the planet's surface. But cataclysms have another mission – for certain time, and not a minute! later, to destroy the planet till the ground zero – to the core. That’s why methods, and the power they have, are appropriate – to shovel the entire planet. And wiping the sweat, they will work hard, very hard – day and night. They have not time to think about weak and gentle humanity – their work has to be done in time! Humanity has the only one way out – to make the Transition to another safe level of the material world where there are no disasters before the beginning of cataclysms. This is the only way of salvation. That's about it warns the end of the Mayan calendar. However, there is still other important for humanity information which transmits the end of the Mayan calendar. Solar activity will cause disasters. According to the Mayan chronology the end of the epoch, which lasted for over five thousand years, will happen on December 21, 2012 at 11:11, that is, at the winter solstice. Why does the Mayan calendar end on the day of the winter solstice, which corresponds to the shortest day and the longest night of the year? Why just this date is selected? 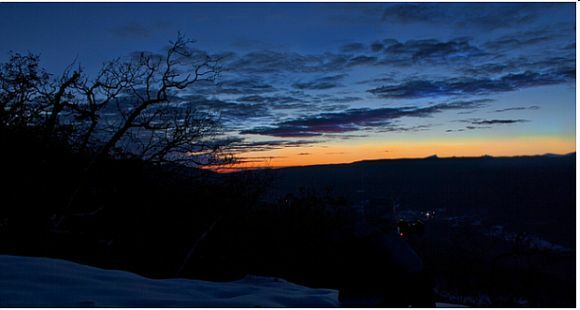 The date of the winter solstice shows the connection of future events with the sun. This date highlights that the sun will play a crucial role in the onset of each following cataclysm. Namely, solar activity, and nothing else will cause violent natural catastrophes. Studies of sun, as noted scientists, show a significant decrease in solar activity, about half of the current. Today is observed a low solar activity, similar to the period from 1645 to 1715 years and is called the Maunder minimum, and the period from 1790 to 1820 years known as the Dalton minimum. In both periods was significantly reduced the surface temperature of Earth. However, more important, in periods of low solar activity was observed frequent and more intense volcanic eruptions. So, in 1707 and 1708 years – during the Maunder minimum – there was some powerful volcanic eruptions, and in early 1709 Europe suffered from the greatest cold, left in written evidence. Many rivers in Europe were frozen to the bottom, including the Daugava, completely frozen Baltic Sea, and in spring 1709 city Riga suffered from the greatest flooding in its history. In 1815, there was a powerful eruption of Tambora volcano. The next year, for most parts of Europe and North America, was named as the year without summer, because even in the summer months in the northern hemisphere, it was snowing, which often had brown or reddish shade color due to volcanic emissions. Scientists point out that even the cycle with the activity below average level can cause dangerous space weather conditions. Strong magnetic storm in 1859, known as the «Carrington phenomenon», occurred during a solar cycle, with about the same index of solar activity, as projected for 2013. This storm provoked by the solar flare, had brought to electrifying of transmission lines, had caused fires in telegraph stations, was the cause of such aurora’ brightness that people could read newspapers in the rays of the red and green glow. In the recent report the National Academy of Sciences concluded that if today there was a magnetic storm of such magnitude, it would be detrimental to high-tech infrastructure of the society in the amount of 1 to 2 trillion US dollars, and it would take four to ten years for complete recovery. For comparison, hurricane Katrina caused damage to the tune of «only» 80 to 125 billion US dollars. At the present moment, the solar cycle is passing through minimum point – the deepest in the last century. In 2008 and 2009 the sun has set records for the number of sunspots, weak solar wind, and low solar irradiance. For more than two years in the sun were observed no significant solar flares. However, scientists have noted that in recent months in the sun arise small sunspots with increasing frequency. They are harbingers of «awakening» of the solar cycle 24. However, according to the forecast the sun will remain calm, at least, over the next year. The expected significant reduction in solar activity, about half of the current, means that the near-Earth space radiation will become more dangerous for people, because it will increase the intensity of galactic cosmic rays. As it is known, the cosmic rays are a cluster of elementary particles and atomic nuclei moving with high energy in the outer space. Galactic are called those of rays that are formed within the solar system. The decrease in solar activity leads to reduction of force of the Sun magnetic field. It will open the way to galactic cosmic rays. As a result of the calm sun cosmic rays, which are usually repelled by the solar wind, will invade into the near-Earth space. Hence, in the near-Earth space will increase the amount of radiation and cosmic rays near the Earth will become more dangerous. Weakening solar wind involves the consequences that affect the entire solar system, beginning from the heliosphere. As it is known, the heliosphere is magnetic bubble, starting from the sun and inflated to huge proportions by the solar wind. Every planet from Mercury to Pluto is located inside the bubble. Heliosphere is the front line of defense of our solar system from galactic cosmic rays. High-energy particles from black holes and supernovas try to enter the solar system, but most are deflected by magnetic field of the heliosphere. However, now this situation will change. Scientists note that the solar wind is not inflating the heliosphere as it did before. This means reducing the level of protection against cosmic rays. Furthermore, in addition to the weakened solar wind, the main magnetic field of the Sun has weakened more than 30% since the mid 1990s. It even stronger reduces the level of natural protection. Usually this is not a threat for people on Earth. Our thick atmosphere and magnetic field of the planet are additional protective layers that ensure our safety. However, the magnetic field of the planet had drastically weakened, and any increase of cosmic rays may have an impact. Now it becomes understandable why extraterrestrials are warning that we should completely stop eating meat and fish, or at least considerably limit of its amount. The longest night of the winter solstice emphasizes that we enter a future shrouded in darkness... and for mankind there comes the hardest period connected with huge losses and an infinite grief. However, despite of very long night and at last spectacular sunrise comes over the Earth and appears the Sun. Thus is presented the great victory of humanity, which in spite of the incredible difficulties, made the Transition in time – before the second preliminary cataclysm. Thus, mankind pulled out the possibility of continuation of life in the new cycle! This always happens in the universe – when humanity reaches the highest level of consciousness and makes the Transition to the next cycle of life – the planet on which will never develop consciousness, collapses by global cataclysms as «waste products». The Earth, due to the end of the cycle of Consciousness of humanity transfers from the group of planets of present development of consciousness into the group of the past development of consciousness – such as Mars, Jupiter, Saturn, Uranus, Neptune and Pluto. However, mankind is not leaving planet Earth yet. Humanity has to make the Transition into the harmony of our planet but only on the other the Highest level of the parallel worlds of the material world. We completely leave the planet Earth just after the end of the cycle of Correction. Mankind will make the Transition into the harmony of Venus. 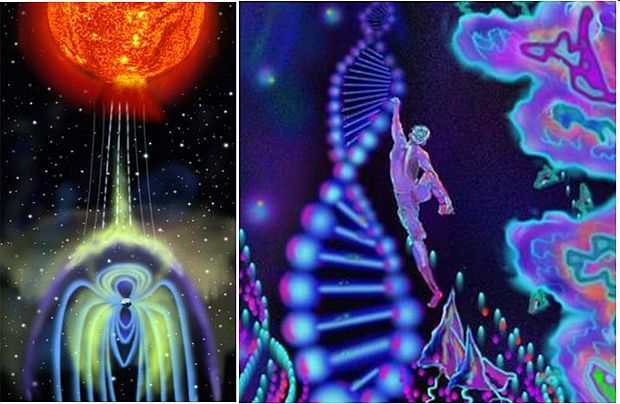 Many millions of years after the Transition, humanity will make trans-energy descent through levels of parallel worlds, step by step, changing body state. These transformations will occur as long as the human race will get a body as solid as we have today. 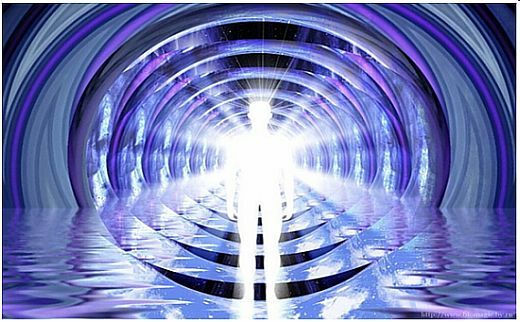 This will mean that mankind is completely materialized at the level of the Crystal structures of the planet Venus – as we are now in the harmony of the Earth. This way will pass the cycle of Consciousness on Venus, and mankind will also make decisions on their own, on the base of given commandments. And then, will be the same Transition in the cycle of Correction that we have to make in the nearest future. Humanity will make this Transition not with joy and shouting «Hurrah! », but under fear of the destruction in global cataclysms. All is the same! Only the level of consciousness of mankind will be much higher. Thus, December 21, 2012 will begin new, yet unknown to mankind the last stage of our planet development – the beginning of the process of its unmanaged complete destruction by global cataclysms. To engage in battle with global cataclysms for humanity is meaningless because it is the mechanisms of destruction of the planet. Constantly, disasters during many millions of years will increase continuously until the complete destruction of the planet, transferring from one type to another. 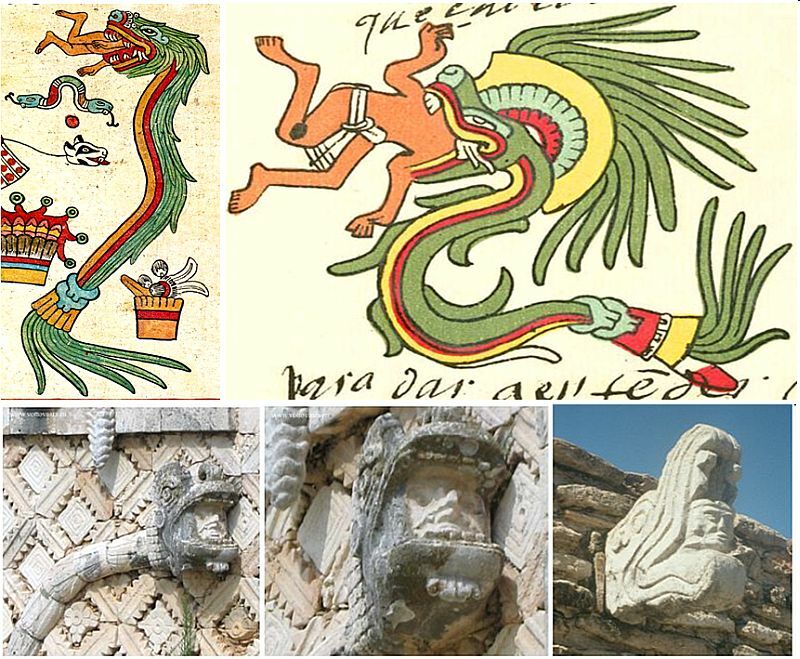 This information is presented in various frescoes and sculptures in the form of dragons-cataclysms swallowing whole people, or by protruding from the jaws of dragons people's heads. Thus, in accordance with the laws of nature, on December 21, 2012 at 00.01 will start the continuous destruction of the various mechanisms of the planet’ destruction manifested in the form of various disasters. They may occur at once, and, perhaps, over time. The incredible power of nature will constantly grow, expanding around the surface of the planet. Nothing is hidden from the rigorous work of these mechanisms, because they will start at the same time in every part of the planet, but just in different ways, fulfilling a common goal – the complete destruction of the planet. They will mindlessly perform its task, completely changing the look of the planet. In the transition from stage to stage mechanisms of the destruction will vary, replacing one another. The initial phase of destruction is leveling the surface of the planet, that is, transformation of the mountains in a pile of sand and stones. Therefore, at first, Earth will look like Mars, and then gradually move to the group of gas planets. Transition up until that time. However, mankind has made other decision – not to make the Transition and wait for the disaster. So, it is self-conscious decision – a choice of civilization of Earth. 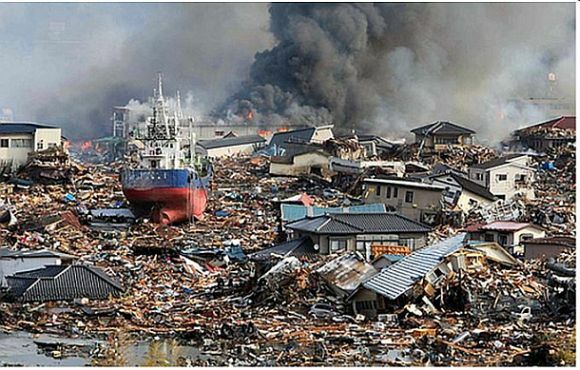 The hurricane Sandy that swept across the east coast of the United States in autumn of 2012, and the tsunami of 2011 in Japan clearly showed that humanity can not resist under even the weakest blows of nature. However, the civilization of Earth, having passed such a hard way of consciousness improvement, can not disappear completely, without a trace, destroyed by global cataclysms of the planet’ destruction – usual phenomenon of nature. However, starting up in the nearest future global cataclysms are incompatible with the life of humanity and organic nature. ETC warn that humanity does not understand the laws of nature and can be destroyed. The only way for continuation of life is the Transition to the safe Highest level of the parallel worlds of the material world. The Transition can be made only through the synchronous unification of humanity’ consciousness, based on deep love and mutual understanding. Incredible power of the flow of light of the sun in zenith in the complex Hochikalka, Mexico shows to mankind strength of the action of the united consciousness in the form of the laser beam necessary for the Transition. Just such enormous power laser beam is required for body destruction and the Transition to the Highest level of the material world into the new cycle of life. Thus, December 21, 2012 is a special day in the history of mankind – it is the invisible border that separates us from the beginning of sudden super-powerful blows of nature that humanity has never faced. This is the boundary of possible total destruction of our civilization. That's about it – the possibility of sudden breakage of the cycle of life warns serene mankind Mayan calendar ending on December 21... This day focuses attention of humanity. It squeezes mankind’ mind, guards, making it more responsive to the events of the environment. However, at this new stage of life unfamiliar for us there is no chaos. Moreover, there is even a scenario of development of future events. And where there is no chaos, there is a strict order, anxiety should not be. The main thing – to understand clearly the sequence of events and to participate actively in this process. Some people worry about the possible overturn of poles of Earth, as a result of unprecedented weakening of the magnetic field. However, before the Transition of humanity into the new cycle of life reversal of magnetic field will not happen. Thus, there is no chaos in the period of global cataclysms beginning and humanity's Transition into the next cycle of life. There is a certain scenario of the sequence of events before the start of global cataclysms. This scenario will allow humanity to focus and make the Transition in time – before the second preliminary cataclysm. Before the beginning of global cataclysms will occur three preliminary cataclysms of incredible strength. In this case, each subsequent cataclysm will be much stronger and more destructive than the previous. Human losses in each of the preliminary cataclysm, will be huge. It is known the epicenters three preliminary cataclysms and the direction of the main blows. It is also known safe territory that will not be affected by the blow during the first preliminary cataclysm. Extraterrestrial civilizations informed humanity about the dates of all trehe preliminary cataclysms. Two of them they marked it by very bright shadow effect of descending dragon on the Kukulkan pyramid in Mexican complex Chichen Itza. Twice a year, at the spring and autumn equinoxes – March 20 and September 22 arises a shadow effect as a huge serpent, which descends from the top of pyramid, squirming all over its body. Dragon is a symbol of global cataclysms in the symbolism of the consciousness of extraterrestrial civilizations. From this point of view, coming year 2013 – the year of the Black Water Snake under the planet Mercury – will continue the relay race of natural disasters, started in 2012 – the year of the Black Water Dragon. The Black Water Snake is all-destroying primitive element of water flow. The symbol of this year brings people strong, but not always desired changes. Black Water Snake swims in the unknown gloomy depths and will bring to our world cataclysms. As it is known snake, on the one hand, is a symbol of wisdom, justice, knowledge, and female power. It has a hidden slowness, stamina and enviable patience. On the other hand, the snake is artful, aggressive, and sometimes even deadly dangerous. It can lay low and wait a long time for the right moment to cause a strong and accurate shot. It is believed that 2013 is the year of balanced and wise decisions, analysis of the situation. For this year, is not typical aggression, but if it is apparent, then it will be hard to handle, it can come down on anyone who gets in the way. Ozone holes enhances the reliability of information about the dates of the two preliminary cataclysms the ozone holes which open each year for several decades also in the dates of spring and autumn equinoxes – March 20-21 and September 22-23. In the spring and autumn on the indicated dates weakening of the magnetic field of Earth occurs by a throw, and the ozone hole reveals the degree of its decreasing. The beginning of global cataclysms is connected with critical weakening of the magnetic field of the planet. The Transition of mankind to the safe Highest level of the material world has to be made before the second preliminary cataclysm. After the second cataclysm the quantity of people will be not enough to start up the mechanism of the Transition and civilization of Earth will be destroyed with the beginning of global cataclysms. This is due to the fact that our consciousness is too imperfect and its action is very weak. In order to start up the mechanism of the Transition is required the laser beam of enormous power and it can cause only synchronous unification of consciousness of all civilization. In the second cataclysm, a lot of people will be destroyed. So, the action of the united consciousness of remained humanity will be already not enough to start up the mechanism of the Transition. Consciousness will not be able to cause an action of required force. What information about cataclysms is important to humanity for continuation of life? Considering the major condition of the Transition – before the second preliminary cataclysm – humanity has to be interested only in the most complete information about the first preliminary cataclysm, because it will allow to reduce various losses and first of all, human losses. About the second preliminary cataclysm we have to know only the date of its occurrence in order to make the Transition in time before this moment. 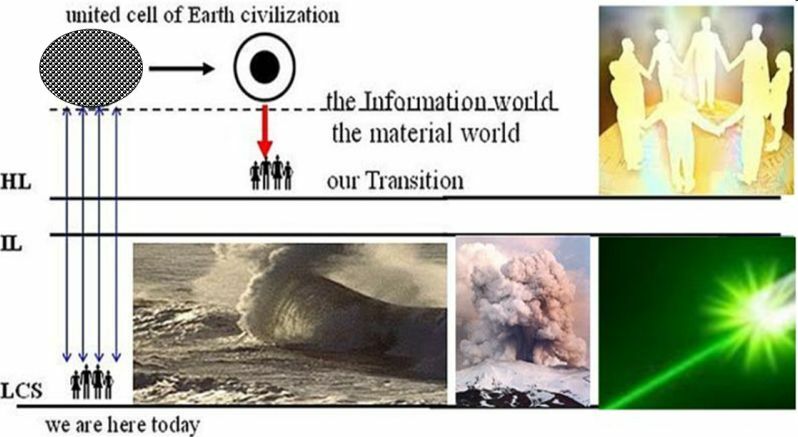 Information about the third, last and the most destructive cataclysm is not interesting to us, because if humanity does not make the Transition to another safe level of the material world in time and wait for the onset of the second preliminary cataclysm, it means the destruction of civilization. On December 21, 2012 ended the cycle of Consciousness of humanity and the Earth enters in the zone of uncontrollable natural disasters. This calls for a rapid Transition to a safe level, because the activity of natural processes will dramatically increase day by day, creating unacceptable conditions for human life. • synchronously to unite consciousness and to create homogeneous resonance structure of consciousness. For this purpose it will be necessary to make trainings on management of breathing. • to impose uniform laser beam on homogeneous structure of consciousness. This is the last type of training for synchronization of consciousness – the imposition of uniform laser beam on the homogeneous resonance structure of the united consciousness of humanity to get the laser beam of maximum power as a result of its strengthening in homogeneous media of the united consciousness. The last final stage of preparation for the Transition consists in joint trainings of all mankind. This phase has to be completed, at least before the specified date of the beginning of the second pre-cataclysm. On behalf of the incredible efforts of all previous generations humanity is obliged to make the Transition in established time – before the second pre-cataclysm. This is the last chance for humanity to save life and to continue consciousness improvement in the new cycle through the General resurrection. The beginning of global cataclysms means that human consciousness has reached the highest level. Hence, the cycle of Consciousness ended, and we have to make the Transition to the next cycle of life – the cycle of Correction. In the cycle of Consciousness humanity perfected consciousness independently, making decisions in accordance with the laws of the universe, known as the commandments. In the cycle of Corrections consciousness will be adjusted forcedly by the fire. Preparation for the upcoming event, each of us has drastically to change the life – fill it with good and mutual understanding. Forgive your enemies, because only they made you to perfect consciousness in the right direction. Do not refuse to help anyone in need and stretching hand to you. We have to live a life, even in thought, in accordance with the commandments. Hand out the debts, both material and spiritual. Think of all the good that your family, relatives and friends have done for you, gave them attention and care. Today each of us has to do everything possible and even impossible to correct or somehow to smooth down intended and accidental errors and violations made during life. In the nearest time we will make the Transition into the cycle of Correction, where everyone will be responsible for the decisions taken today in the cycle of Consciousness and committed actions. And nothing could be changed. We will have a very short time – just a few months, because our decision about the Transition is very harshly pushed behind by global cataclysms. No time to think, we just have to make it! Never, under no circumstances – neither unhappy love, nor despair or terror should not lead to suicide. The decision about suicide is the hardest crime, not only against individual and his family, but also against humanity. People, who made such a heavy decision, will never see or hug their loved ones at the moment of the General resurrection. These people will forever go out of our civilization, and will go through absolutely different transformations. Suicide is also a crime against the civilization. One of the main criteria for the Transition is the quantity of people uniting consciousness, because it determines the force caused by the action. Today on the planet is limited number of people whose consciousness possesses an action. It is possible that a certain number of people may not suffice the civilization to make the Transition in the next cycle of life. The people of Earth should more careful concern to each other, with deep mutual understanding in order to stop suicide. We all are people of one destiny, because we can not leave the planet, and should feel great joy from the fact that we have an opportunity to continue life through the Transition. And we will make it in time, despite a very short period of time given to mankind for trainings. Thus, not the End of the world, but global cataclysms are dangerous for humanity. Only the End of the World and the Transition will provide all of us the continuation of life, and the sooner we will achieve it’ coming, the better for all of us. December 21, 2012 we did not make the Transition, so, unfortunately, the End of the world did not come. In order that the End of the world has come, which means the Transition to a new cycle of life – we have to struggle, each of us and all mankind together.